One of the downsides to having a PhD is that my relatives have no idea what it is I do. For some it seems that having a PhD means that I am a "scientist" with expertise in anything that could be lumped under the term science. My degree is actually in computer science and then I specialized in a narrow subset of that field. From there I went into industry to work on projects that are only vaguely related to my dissertation. My general point though is that I don't have any particular expertise in other scientific fields. I do have an interest and read some books intended for laymen, but that doesn't mean I'm an expert on those topics. A number of my relatives have recently taken an interest in global warming and wanted my opinion on the matter because I was the "scientist" in the room. My general answer is to just point to the scientific consensus and state that I provisionally accept it without being aware of all of the details. The EPA provides a summary of evidence for climate change and in particular a page describing the current state of knowledge. This put me at odds with them suggesting that global warming is some sort of conspiracy and that there is no real evidence. I couldn't really tell whether they disagree that the earth is warming or whether they just disagree that human activity is causing or at least contributing to it. The only thing that really seemed consistent in their arguments was the certainty that they were right and that nothing needed to be done to rectify the situation. Of course, I lost the debate because my typical retort was "I don't know." I haven't spent much time looking into global warming so I'm not that well versed on the evidence to support it. 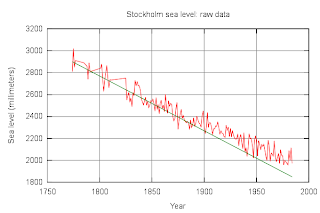 Global average sea level rose at an average rate of around 1.8 mm per year over 1961 to 2003 and at an average rate of about 3.1 mm per year from 1993 to 2003. That is a pretty accurate measurement. Go to the ocean and look at the waves and tides. 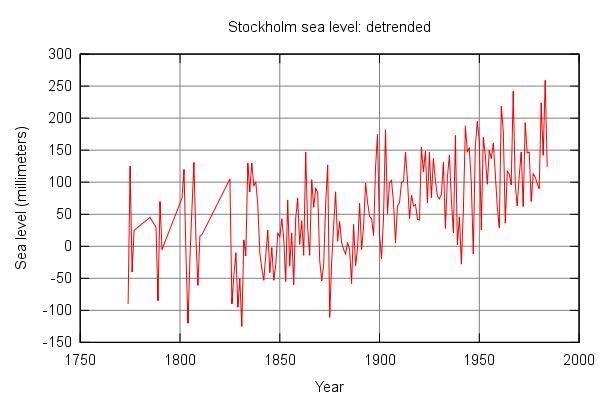 How would you accurately measure the average sea level? Now consider less obvious sources of problems such as evaporation and how much water gets stuck on land vs returned to the oceans from year to year. These days we use measurements from satellites to help improve the accuracy, but what is the tried and true technique for measuring the sea level? The answer is the tide gauge. Tide gauges are cool because of the simplicity of the basic mechanism. It is essentially a big pipe with a hole below the sea level to allow water in. The pipe protects the water inside from all of the normal disturbances on the surface such as waves. As the name suggests it will still vary with the tides, but it allows fairly accurate measurement of the high and low tides. 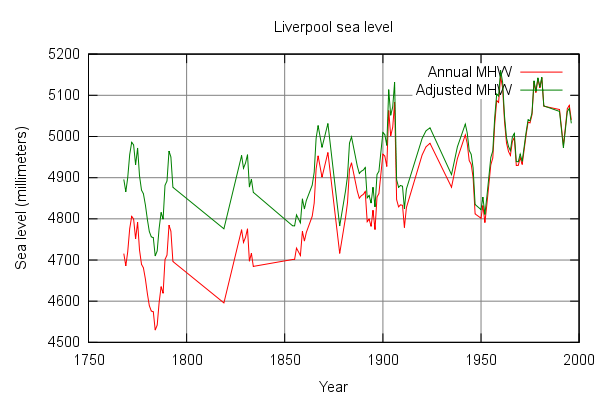 If you record this for a long enough time you could work out the average sea level for the location of the gauge as well as how this has changed over time. Place enough of these devices around the world and keep track of the measurements and you can figure out the average global sea level and if there are any discrepancies across the world. Both the annual and adjusted MHW show that the MHW level is rising. The adjusted value at a slower rate than the raw annual reading, in particular for older measurements. 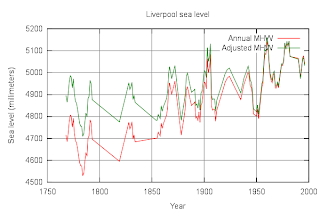 A 2008 paper uses these sources to show a trend in mean sea level from 1700 to 2000. 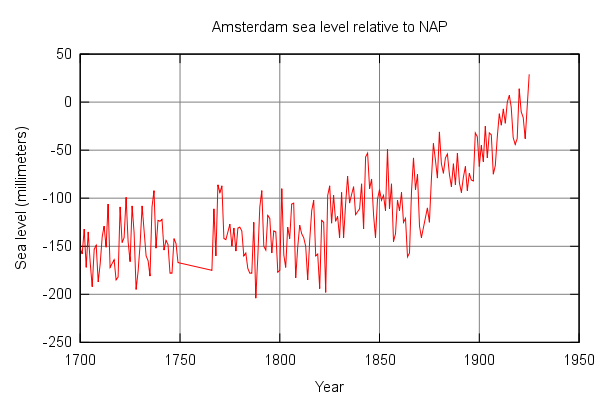 The general trend is that mean sea level has been increasing for the last 200 years. So what does this tell us? 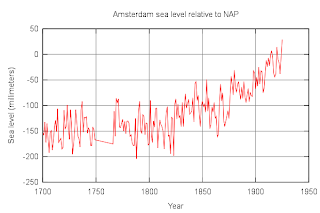 The three data sets being checked here are all from Europe and it is pretty clear that the sea level in that region has been rising for the last 200 years. 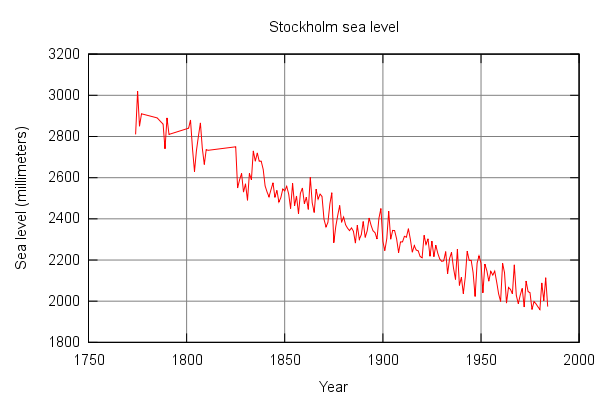 It would be interesting to see what the longer term sea level has looked like. In particular, are there any long term cyclical trends that take place over thousands of years. Such data may exist, I looked at a handful of the top sources that came up when searching for information and as stated in the opening I am not an expert in this field. There are some interesting complications such as the post-glacial rebounding that can make it difficult to discern what is really happening. 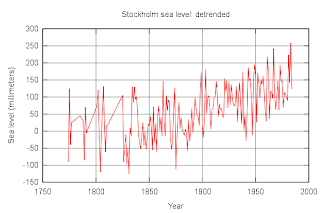 I should also point out that I did not look at the evidence for what was causing the rise in sea level. Of course, the general explanation is melting ice sheets as well as just the expansion of water due to warmer oceans. At some point I'll have to look at the evidence for the actual temperature changes, but most importantly (to me at least), it looks like climate change will be an interesting topic to explore.